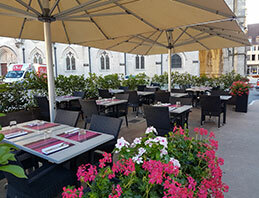 The restaurant, opposite Notre Dame Church in the center of the city, has seating for 50 diners, with the terrace accomodating a further 30. Our Chef has created a menu of traditional and gastronomic dishes, notably the specialities from Burgundy : "Oeufs en meurette", "Boeuf Bourguignon", using as a base exclusively fresh and local produce. A three course set lunch, changed daily from monday till friday, is available for 15€ (2 courses) or 19€ (complete menu). All days, for lunch time and diner, menus "à la carte" are proposed from 25€ and main course from 16€. The restaurant is opened from tuesday till saturday for lunch time from lunch till 1:30 pm and for diner from 7:00 till 8:30 pm during the week and 9:00 pm friday and saturday (closed on sunday). For lunch monday, only the special of the day is proposed. The house is no smoking and doesn't accept animal inside.